The Northwest Mechanical Office sets the tone for everything we do. Since "Comfort is our Concern" we made this building live up to our company motto. By having a complete working showroom our clients can come and feel the warmth while looking at the superior quality of the work we perform. By using the latest boiler technology and integrated control strategy for heating and cooling, this building is constantly comfortable. It was no small feat turning this former Jiffy Lube into an office building complete with showroom, warehouse, classroom, conference room, and company offices. The existing 16" suspended concrete slab Main Floor was over-poured with Gypcrete and embedded with Uponor radiant tubing to provide comfort for this level. The upper floor was also radiant floor heated with Uponor Quik Trak to provide radiant warmth to our Service Department and meeting room. 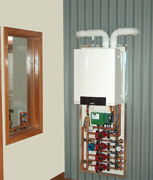 We installed a Hi-Velocity air heating and cooling system that is heated by the Buderus boiler system and cooled by a chilled water system. The air is filtered using a SunPure 2000 filtration system with catalytic converter, MER 11 filter and UV light to kill airborne bacteria and to provide a clean, fresh indoor air environment. In 2006 we installed a 3.4 kW Sanyo Solar PV System as an awning over the upper floor windows to shade them during the summer while providing electricity to the building. The energy saved by reduced cooling needs equals the energy produced by the solar modules, so we get double the benefit. The new corporate headquarters is a complement to our professional creed, of providing customers with superior quality products and top-notch workmanship while incorporating the aesthetics of the homeowner. 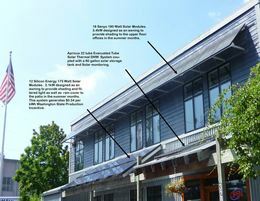 Visible to thousands of motorists on NE 145th Street our office shows 3 solar systems performing daily. 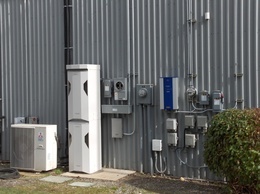 The West side of our building has the two solar inverters, battery back up and a Ductless Split Heat Pump system and reverse cycle chiller to cool the building. 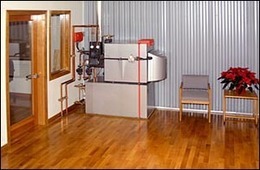 Our first boiler system in 2001 was a beautiful Viessmann Vitola boiler on a stainless steel Vitocel DHW tank. The Main Floor is heated with radiant floor under a floating hardwood. Come by and take off your shoes.